Zambian High Commissioner to India Judith Kapijimpanga has expressed her dismay at verbal attacks by Chishimba Kambwili directed at a person believed to be of Indian origin working on the expansion of the road in Zambia. But National Democratic Congress (NDC) Copperbelt chairperson Chipoka Mulenga says there is no foreign adopted developmental approach that was good enough for Zambia. According to a statement released by First Secretary for Press and Tourism at the Zambia Mission in New Delhi, Bangwe Naviley, Kapijimpanga asked Kambwili to follow procedure especially on matters that border on international relations. “Mr. 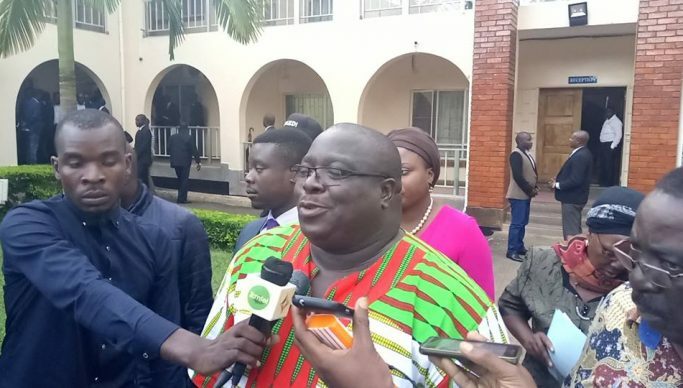 Kambwili understands the complaints procedure as former Minister of Labour and that his words are unwarranted in the eyes of the international community having served as Minister of Foreign Affairs too” said Kapijimpanga. She added that Kambwili, the Roan member of parliament should have taken time to understand whether the person was born and raised in Zambia. “Mr. Kambwili is a wrong person to attack any nationality working in Zambia because his own spouse works in the United Kingdom and such outbursts threaten the lives of Zambians working abroad in case others retaliated” she noted. Kapijimpanga said pertinent issues that were meant to benefit the masses such as decongestion of the Lusaka roads project jointly funded by India and Zambia could not be resolved in an emotional manner. “Zambians have never looked at the colour of any person, once having a white Republican Vice-president Dr. Guy Scott, people of Indian origin such as Dipak Patel as former Commerce Minister and former Agriculture, Minister Suresh Desai who were elected by the people”, Kapijimpanga observed. Kapijimpanga said Kambwili should term his watery mouth before he pludges the nation into deep waters of trouble. However, Mulenga said that the country needed men and women like Kambwili that knew what was good for this country. Offering solidarity to NDC President Chishimba Kambwili who is seen in the video castigating foreigner operating a compactor, Mulenga said that there is no foreign championed developmental agenda which can propel a country to success. He said every investor had only one focus of maximizing profit and not to develop a country rather than theirs. “Most of us even on this forum have a lot of young trained operators that can’t get jobs because Asians are operating those compactors. We’ve seen Chinese selling fish, chickens, maize and tomatoes at Soweto market and the streets. How is the government’s response to that? No attention at all. I stand with CK. He’s being pragmatic”. Mulenga said Rwanda has been developed by its own locals and not foreigners.